Travel with Kevin and Ruth! 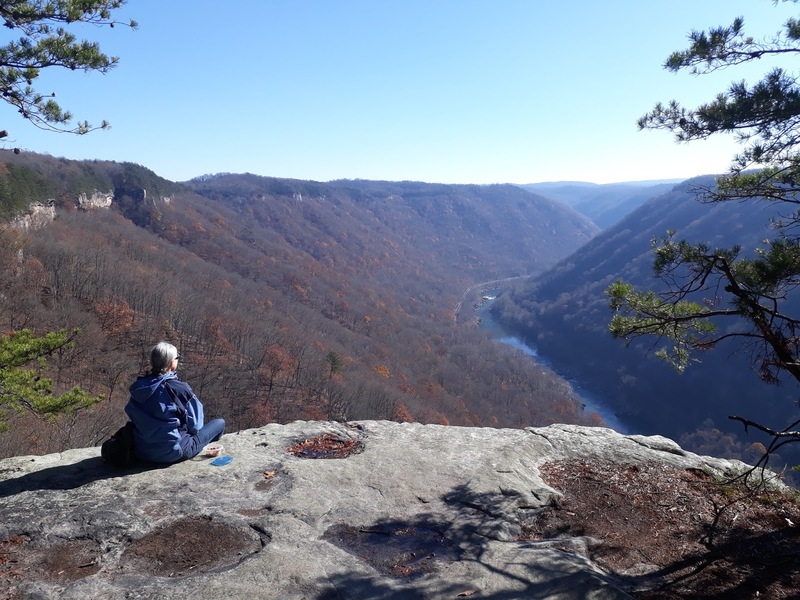 : Great views, and another free overnight spot! We got up yesterday morning, and drove the short distance to the New River Gorge visitors center. We knew that it didn't open until 9:00am, so we sat in Sherman and had some breakfast. When we were ready, we went up to the entrance. "Closed due to Thanksgiving. Will re-open Friday at 9:00am". But, we were still able to see the gorge and the bridge and go for a short 2.5 mile (4 km) hike. Lots of steps to get down to the viewing platform. Ruth, and the New River Gorge Bridge. The bridge was built in 1977. 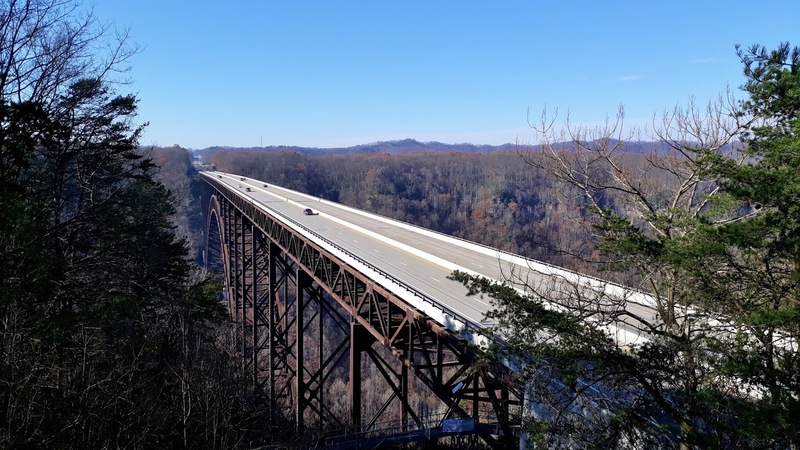 It's currently the third tallest bridge in the United States, with the road surface being 876 feet above the river. Notice the clear blue sky?? We decided to do the 2.5 mile (4 km) Endless Wall hike. Now this is a nice spot to take a break! Did I mention there was a clear blue sky? It was a beautiful day! High of only about 50F, (10C), but with the sunny sky it was beautiful. We still had some driving to do though. I had read about a municipal park in St. Albans, West Virginia that has 5 RV sites... with electricity... and they are free for a two night stay! So that's where we headed, in the hopes that there would be an opening for us. View when we drove over the bridge. We took the Interstate through Charleston, West Virginia. Hardly any traffic going through the city on Thanksgiving Thursday afternoon. I guess everyone was at home cooking their turkeys! Arrived at the park to see only one other unit parked up. Beautiful view along the river. But, it's not perfect. While the view along the river is nice, we are parked about 20 feet from a busy four lane road, and on the other side of the road is a McDonalds and a Kmart and a shopping mall. So there's a lot of road noise. But, we slept well and we get free wifi from the McDonalds and a nearby car dealership. Pretty good, so we'll stay put for two nights! Yesterday's drive, 86 miles (138 kms). Even with the road noise, that seems like a pretty darned nice spot. Plus, free wifi? Wow. Have fun! We love the free part! That's the only state we haven't been to and really want to go. 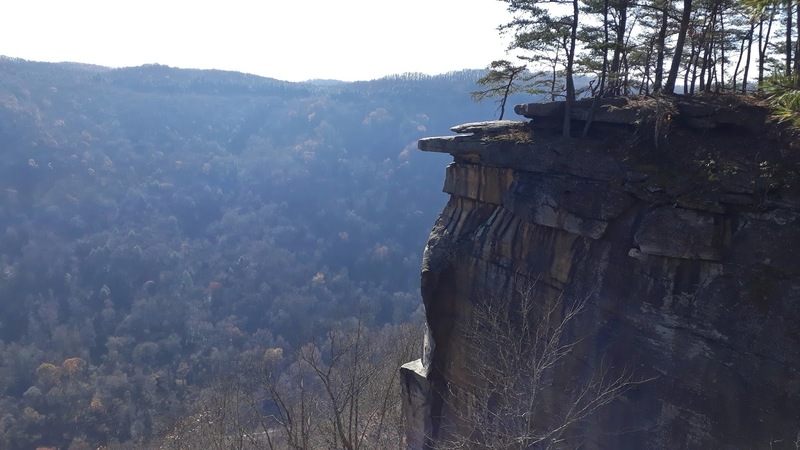 We have loved driving through West Virginia and wished that we had warmer weather and more time on our side because we easily could have spent more time here. We may just have to return one day when we don't have any kind of time line. If I had a McDonald's right across the street, I think I'd stay two nights too lol. It was a fantastic day. Wish we didn't have to move on down the road but we had plans to meet up with friends in Lexington for the weekend. Free is a good price for any spot! More towns should have spots like that... Beautiful weather. No, that isn't true at least not for us because there are some places that you couldn't even PAY us to stay overnight! ;-) We agree more towns should offer a few sites like this. I stayed there too for several days. If I remember right it was then 4 days limit.The road noise didn't bother me at all. The dumpstation there was also convenient. We've traveled ALL over the U.S. but never been there! So we especially enjoyed the photos you posted. Isn't it strange that on a special day of "thanks", so many things are closed except for shopping malls ! Glad you enjoyed the photos. It was too bad that the Visitor's Center was closed, there were actually quite a few people that arrived there and expected it to be open but I guess they deserve time with their families on a special holiday too. OMG: looking over that cliff gives me a woozy stomach. I envy how you find these interesting spots to visit. I love that they are not touristy spots because there are not other people in your pictures. Thanks for sharing so we can watch for them in our travels. The internet is a very helpful tool! :-) I have found many interesting places from several hiking groups that I am on, on facebook along with some of the RVing groups. If I see a picture someone posts and I really like it then I research it and add it to my list of places to visit. I also like Pinterest for the same reason. Trust me in the height of summer New River Gorge would be a fairly touristy kind of place, at this time of year not so much but we did still see people just not lots. Sounds like a great deal to me! It worked out perfect for us! Hardly even notice the road noise, it certainly never kept us from having a good sleep. Looks like you are enjoying your time traveling! Nice pictures! We are loving it and even more so once this weekend is over because other than being at the Texas/Mexico border for January 5th we have no other schedule to follow and can stop when we want to and enjoy the sights along the way more. Not sure that road would have been conducive to the motorhome but we could have hiked down to it! Unfortunately we needed to be in Lexington for Saturday and didn't have enough time on our hands for that. I have stayed there myself before and enjoyed the stay with the WiFi and dump station. Also enjoy the barges going down the river. Yes, it is a nice little park. We were quite happy here for the two nights. We only saw one barge going down the river though. We are so enjoying your pictures and travel information. What a great journey you have begun!